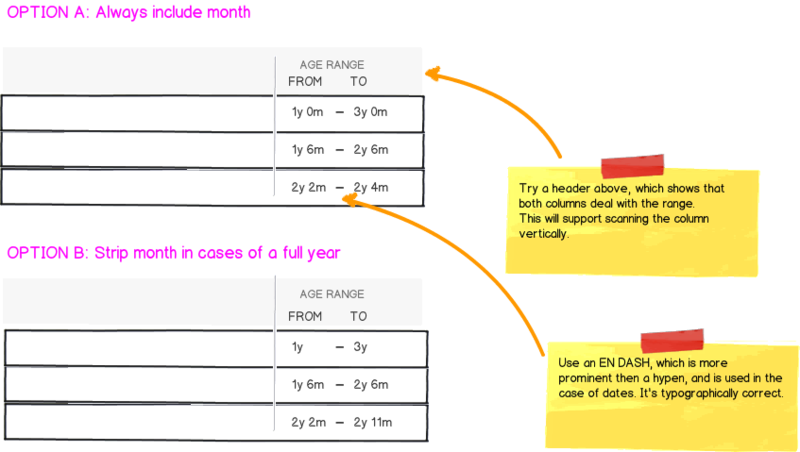 We have a form where a user will enter a range of ages in the form of [start year] [start month] [end year] [end month] for the age of a child. E.x. would be 1 years and 6 months as the start age and 3 years as the end range. These results are displayed in a table and I am trying to find the best way to present a condensed version of this. My initial approach was just to list it as 1 year and 6 months to 3 years old which is pretty verbose and takes up a lot of space. Alternatively I could do 1 1/2 year to 3 years old but depending on the month entered it could be a pretty ugly fraction. Is there a better way to approach this? It seems like there are 2 issues here: how to save space, and legibility in the data table. 1. Space: For saving space, you have yr, y, and for month you have mo, m.
You can scan the list vertically. That's an advantage with tabular data. You can trade off the verbose option ('year'), but make up for it in the alignment and legibility with the small separate columns. You can make this columns pretty tight, so overall it doesn't take up much table space. Maybe not pertinent, but why not using months instead, as a primary view, while providing the verbose option as an alternative? More compact solution and not duplication of the word "years"
What would be the best way to format a time range? Is it a good idea to collapse a range of dates when formatting an interval of just one day?